Spread a little love by displaying these Heart Whirls! 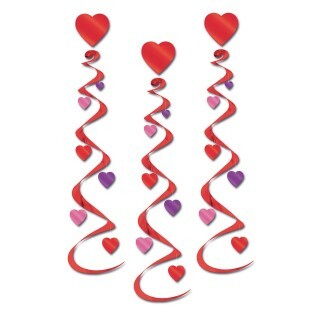 Spread a little love by displaying these Heart Whirls from just about any ceiling for Valentine’s Day. You get 18 identical whirls per package that hang 30”L. The Heart Whirls have a heart at the top with a red spiral with smaller pink, red, and purple hearts that go down the whirl.